Since Pope Francis will visit Philadelphia on Sep 26th and 27th, it will be difficult for many to travel to Philly. 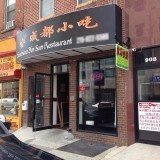 Nevertheless, I like to write a short review for Szechuan Dim Sum Restaurant: a small Chinese Szechuan restaurant in Philadelphia Chinatown on Arch Street (906 Arch Street). It is easy to overlook as it is small and it is not that busy. Nevertheless, the foods there are nice. It focuses on smaller dishes instead of the more famous Szechuan dishes. This is nice because it add greater diversity. I went there a few times when it was first opened in the early 2014, then I stopped going simply because I don’t eat Szechuan food very often. Last week I went there again, and ordered the Dan Dan Noodle and the Husband and Wife Beef Slice (or they call it: Beef Lover’s Quarrel in Chili Oil). I thought the Dan Dan Noodle was good, but not vastly better than its competitors. The Husband and Wife Beef Slices actually was a bit better than most other places. I didn’t get the House Special Sichuan Style Soft Tofu this time, but it has always been one of its most outstanding small dishes, so give it a try if you are not afraid of spicy/hot food. I should also mentioned that early in 2014 I met a couple (mom and son) from Chengdu (capital city of Sichuan) at this restaurant. They ordered numerous dishes and seemed to be just trying a little bit of everything. We hit it off and chatted for awhile. The mom unequivocally said that most of the dishes here are authentic and tasted just the ones from Chengdu. So for those of you who want to try a small Chinese Szechuan restaurant which is slightly different from the larger ones, I recommend this place. what is this dish? it is sweet? 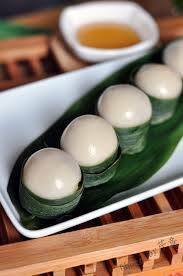 Leaf Wrap Rice w. Sweetened Bean Paste. I see, like steamed tang yuan. They should be. I haven’t tried them yet. If I didn’t have such a wide array of good & “authentic” Sichuan food at least once a week where I live, I would totally check this place out. Maybe when I’m in Philly longer than just w/ends at a time - sounds great! Thx for posting, Chem. I went back there this Sat and Sun. On Sat, I ordered the a stew beef soup noodle and desert: a Szechuan Three Canon Balls (they called it Sichuan cuisine Dim Sum). I would say they are both fair, but not great. However, on Sunday, I tried the Beef Tendon with Spicy Sauce (on the menu, it is called tender, but it is really tendon in my opinion). Now, that I actual think was well made. So I recommend it. Unfortunately, I ate it all without taking a photo. Looks great, Chem! One of my favorite appetizers at a local Sichuan place.